I'm used to serving sites from Apache, but I am now forced to use an IIS server. 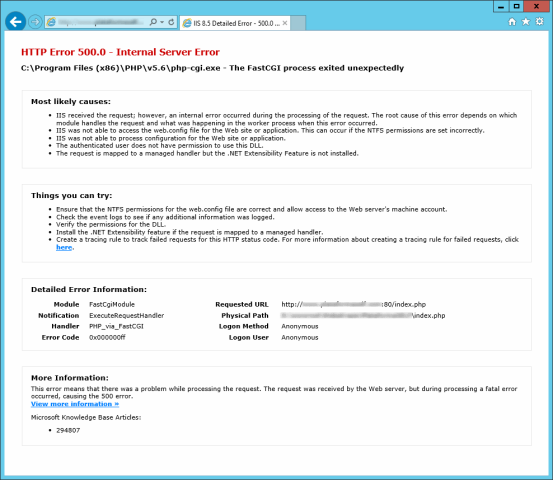 A number of my PHP pages are returning error 500 and I can't debug because IIS is suppressing the error messages. I've tried ini_set('display_errors',1); in code but to no avail. Errors are shown on some sites but not the one in particular that I want to debug so I don't think it is a global PHP setting, but rather something to do with the site settings for that site. I can't find a clear answer as to how to enable the displaying PHP errors. I've found this link but am not sure where to find "system.webServer->httpErrors". How can I enable the displaying errors in PHP under IIS? How about logging them instead? error_log = location/of/logfile to log to a file. I found out, that it's a good idea to access an IIS-hosted page with InternetExplorer for testing. In my case the php-error-logs where clean - got no clue from there. Maybe also try connecting on from http://localhost on the server itself. Not the answer you're looking for? Browse other questions tagged php iis or ask your own question. IIS6 + PHP + FastCGI 500 Errors - Where to start looking? IIS 7 not reporting PHP errors? How can I enable error logging and where are the errors logs for IIS 8? How can I display and log PHP errors on IIS7.5?